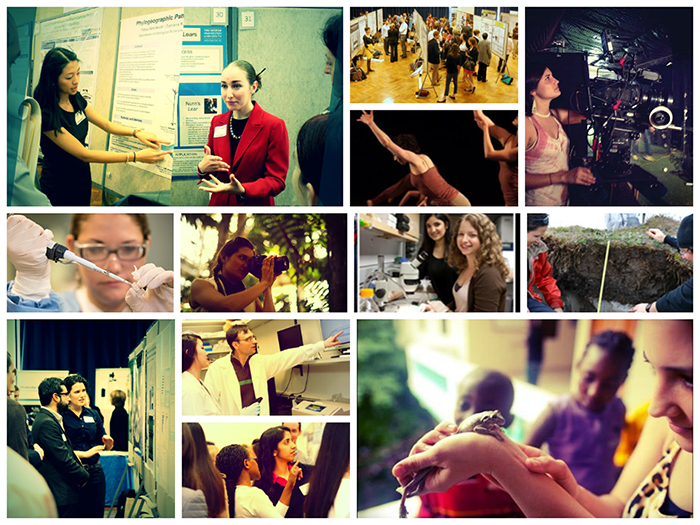 You are here: Home / Student Resources / Why Get Involved in Undergraduate Research? Getting involved in an undergraduate research experience means making original contributions to knowledge as an undergraduate student through research, scholarship, or creative activity. You can either work on a faculty member's research project or develop your own independent project with faculty guidance. Undergraduate research is for everyone - for art, English, and sociology majors, not just science and engineering majors, for freshmen and sophomores as well as juniors and seniors. It can take place almost anywhere at GW - not just in the College of Arts and Sciences but also in the Medical Center, School of Business, Law School, and other schools. It can also take place in local community agencies through the integration of a research project into a service learning experience or internship. Thousands of undergraduate students nationwide are doing it, enjoying it, and learning from it. At GW, involving undergraduate students in research is part of our strategic plan for improving the quality of undergraduate education. You'll understand your field much better if you understand not just what is known but how it came to be known. You'll gain real depth of knowledge of the topic you study. You'll be challenged, stretched, made to think in new ways. You'll take advantage of learning opportunities available only at research universities like GW. You'll feel more a part of the intellectual life of the University. You'll get to know a professor, and a professor will get to know you. You'll help your faculty mentor advance knowledge in his or her field. You'll hone some of the skills employers most want - skills in oral and written communication, teamwork, and problem solving, for example. You'll clarify your career goals (even if only to decide that research is not for you). You can increase your chances of getting a good job. You can contribute to solving some of society's pressing problems. You'll be part of a national movement to enrich undergraduate education through meaningful involvement in scholarly inquiry. You'll remember your undergraduate research experiences many years later as the best part of your academic experience.